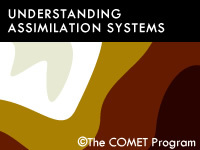 Understanding Assimilation Systems: How Models Create Their Initial Conditions, is part of the "NWP Training Series: Effective Use of NWP in the Forecast Process." This module explains the data assimilation process, including the role of the model itself as well as the observations. It provides learners an appreciation for how models use data as a function of model resolution and data type, how data influence the analysis, the limitations of data assimilation systems, the importance of initial conditions on the quality of NWP guidance, as well as the challenges of assessing the quality of NWP guidance based on the initial conditions. The differences between 3d-var with isotropic background covariances, anisotropic background covariances, 4d-var, and ensemble Kalman filter are conceptually illustrated. Back in 2000, the subject matter expert for this module was Dr. Ralph Petersen of the National Centers for Environmental Prediction, Environmental Modeling Center (NCEP/EMC). Revisions to the module were made in 2009 by Drs. Bill Bua and Stephen Jascourt, from the NWP team at UCAR/COMET. This module provides the most logical (being less technical with the mathematical/statistical computations) lecture in understanding the foundation of data assimilation system. I actually had attended one training about the theoretical foundation of the DA (3D & 4Dvar) and I got lost as the way it was discussed was highly mathematical/statistical (cost function minimization algorithm, error covariances etc.). Reading this module (though it took me days as this module was so thorough and informative) helped me understand more complicated stages of the DA system. If you're into understanding the holistic view of DA (especially if you're a researcher who is still new in the DA concept), start from this module. This module is extremely thorough. It explains many nuances about why assimilation steps are done the way they are. The module is useful for those who work with analysis products as well as for operational forecasters. The colloquial descriptions in some sections are unusual for a subject which is usually presented using rigorous mathematics, and these informal sections are very helpful in building intuition. This is a difficult module covering a difficult subject well. I struggled with grasping this module initially. It is very in-depth and I would suppose very important for someone who is getting into forecast modeling. However, most of the time I was a little lost. I don't know if there is a better way to explain data assimilation, but I know I would have liked a more basic module that got the most important points across. July 2014: Version 2 of the NWP course is still valid throughout. The most recent data assimilation system used in NCEP models, the Hybrid-EnKF, is not included. This data assimilation system combines 3D-VAR and EnKF into a single system and gets advantages from both. More discussion of the Hybrid-EnKF system can be found in the GFS May 2012 "splash' announcement at http://www.meted.ucar.edu/nwp/pcu2/GFS_20120522_HybEnKF3DVAR.htm.